Corticosteroids have been used as anticancer agents since the 1940s, with activity reported in a wide variety of solid tumors, including breast and prostate cancer, and the lymphoid hematologic malignancies. 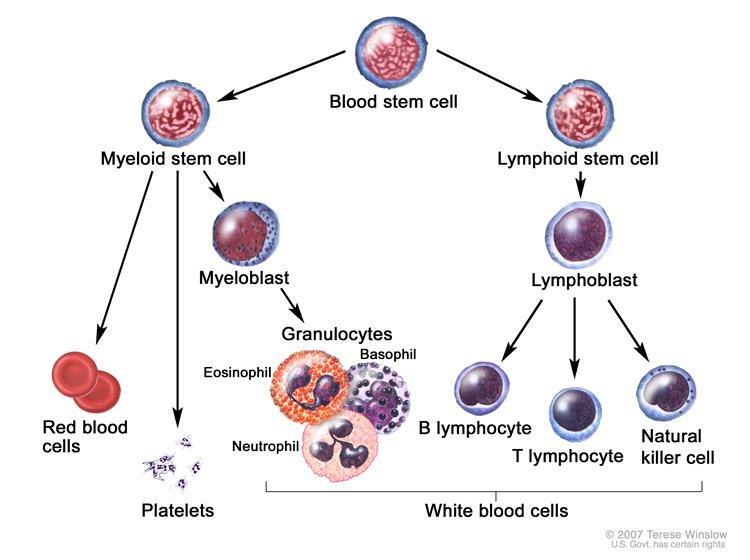 They are commonly found in regimens for acute lymphocytic leukemia, Hodgkin’s and non-Hodgkin’s lymphoma, myeloma, and chronic lymphocytic leukemia. Corticosteroids in the Treatment of Neoplasms Lorraine I. McKay, PhD and John A. Cidlowski, PhD. in Holland-Frei Cancer Medicine. 6th edition. However, as Dana Farber’s Dr. George Canellos, M.D. ponders in Can MOPP be replaced in the treatment of advanced Hodgkin’s disease? Semin Oncol. Canellos GP1. 1990 Feb;17(1 Suppl 2):2-6., many dose-limiting toxicities occur with MOPP (mechlorethamine, vincristine, procarbazine, prednisone) therapy used in advanced Hodgkin’s disease. Although, at the time, he generally was looking to establish combination therapies with less side effect, the advent of more personalized therapies as well as immunotherapies may indeed replace the older regimens for B-cell malignancies and Hodgkin’s disease, and their panels of toxicities. Short-term side effects of prednisone (Cancer.gov prednisone description with side effects) as with all glucocorticoids, include high blood glucose levels (especially in patients with diabetes mellitus or on other medications that increase blood glucose, such as tacrolimus) and mineralocorticoid effects such as fluid retention. The mineralocorticoid effects of prednisone are minor, which is why it is not used in the management of adrenal insufficiency, unless a more potent mineralocorticoid is administered concomitantly. Long-term side effects include Cushing’s syndrome, steroid dementia syndrome, truncal weight gain, osteoporosis, glaucoma and cataracts, type II diabetes mellitus, and depression upon dose reduction or cessation. Therefore the oncology world has been moving toward therapies which are more selective with less dose-limiting toxicities (e.g. Rituximab), and are looking to CAR-T therapies as a possible replacement for standard chemotherapeutic regimens. However, as with prednisone, there have been serious adverse events in some CAR-T clinical trials. Luckily clinicians, as discussed below, have found supportive therapies to alleviate the most severe side effects to CAR-T. This section will be refer to supportive therapies as those adjuvant therapy given to alleviate patient discomfort, reduce toxicities and adverse event, or support patient well-being during their course of chemotherapy, not adjuvant therapy to enhance antitumoral effect. The following is a brief re-post of some of the important points for reference to this new posting. Early evidence had suggested that adoptive transfer of tumor-infiltrating lymphocytes, after depletion of circulating lymphocytes, could result in a clinical response in some tumor patients however developments showed autologous T-cells (obtained from same patient) could be engineered to express tumor-associated antigens (TAA) and replace the TILS in the clinical setting. The first efforts to engineer T cells to be used as a cancer treatment began in the early 1990s. Since then, researchers have learned how to produce T cells that express chimeric antigen receptors (CARs) that recognize specific targets on cancer cells. The T cells are genetically modified to produce these receptors. To do this, researchers use viral vectors that are stripped of their ability to cause illness but that retain the capacity to integrate into cells’ DNA to deliver the genetic material needed to produce the T-cell receptors. The second- and third-generation CARs typically consist of a piece of monoclonal antibody, called a single-chain variable fragment (scFv), that resides on the outside of the T-cell membrane and is linked to stimulatory molecules (Co-stim 1 and Co-stim 2) inside the T cell. The scFv portion guides the cell to its target antigen. Once the T cell binds to its target antigen, the stimulatory molecules provide the necessary signals for the T cell to become fully active. In this fully active state, the T cells can more effectively proliferate and attack cancer cells. Early Toxic effects– Cytokine Release Syndrome– The effectiveness of CART therapy has been manifested by release of high levels of cytokines resulting in fever and inflammatory sequelae. One such cytokine, interleukin 6, has been attributed to this side effect and investigators have successfully used an IL6 receptor antagonist, tocilizumab (Acterma™), to alleviate symptoms of cytokine release syndrome (see review Adoptive T-cell therapy: adverse events and safety switches by Siok-Keen Tey). 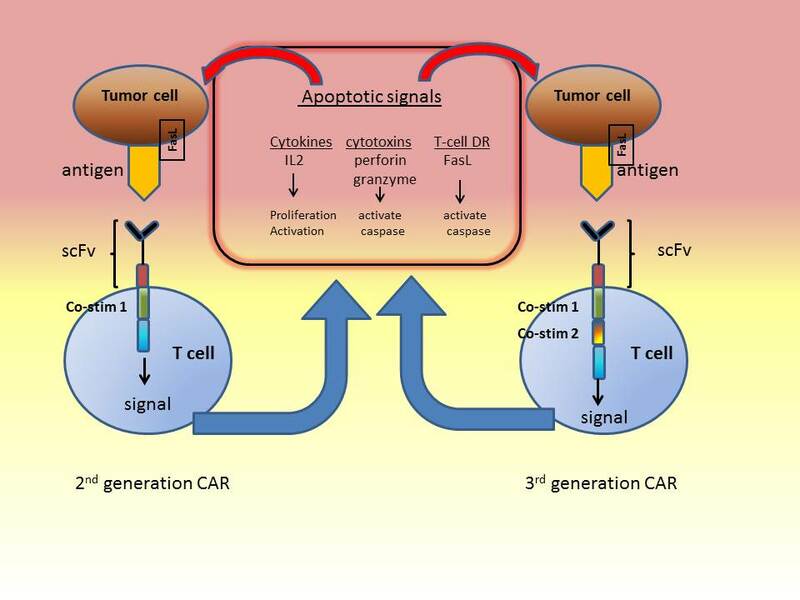 Early Toxic effects – Over-activation of CAR T-cells; mitigation by dose escalation strategy (as authors in reference  proposed). Most trials give billions of genetically modified cells to a patient. Ertl HC, Zaia J, Rosenberg SA, June CH, Dotti G, Kahn J, Cooper LJ, Corrigan-Curay J, Strome SE: Considerations for the clinical application of chimeric antigen receptor T cells: observations from a recombinant DNA Advisory Committee Symposium held June 15, 2010. Cancer research 2011, 71(9):3175-3181. Morgan RA, Yang JC, Kitano M, Dudley ME, Laurencot CM, Rosenberg SA: Case report of a serious adverse event following the administration of T cells transduced with a chimeric antigen receptor recognizing ERBB2. Molecular therapy : the journal of the American Society of Gene Therapy 2010, 18(4):843-851. Kandalaft LE, Powell DJ, Jr., Coukos G: A phase I clinical trial of adoptive transfer of folate receptor-alpha redirected autologous T cells for recurrent ovarian cancer. Journal of translational medicine 2012, 10:157. Since 2005, SITC honors a luminary in the field who has significantly contributed to the advancement of cancer immunotherapy research by presenting the annual Richard V. Smalley MD Memorial Award, which is associated with the Smalley keynote lecture at the Annual SITC meeting. The awardee this year Carl H. June of the University of Pennsylvania, has led innovative translational research for over 25 years, with the most recent focus being the development of the Chimeric Antigen Receptor modified T-cell (CART) approach. Carl June summarized how the past 15 years of progress have expanded upon the original concept presented by Zelig Eshhar , in which variable regions of tumor-reactive monoclonal antibodies (mAbs) (VH and VL) are linked to transmembrane and signaling domains of T cell activating molecules to create membrane based receptors with specificity for the tumor antigen recognized by the original mAb . These receptors can be transfected into T cells, for example with lentiviruses. Pre-clinical work demonstrated how CD3-ζ and 41BB signaling components enhanced proliferation and survival of T cells in hypoxic conditions. The initial clinical work has been done with CART reactive to CD-19 on malignant B cells, with progress particularly in chronic lymphocytic leukemia (CLL) in adults and acute lymphoblastic leukemia (ALL) in children [5,6]. As of the SITC meeting, CarlJune’s team had treated 35 patients with CLL and 20 with ALL. Of the 20 with ALL, ½ had relapsed after allogeneic BMT. Of these 20 children, 17 were in complete remission, and with persistent B cell aplasia; documenting the persistent effects of the CART cells. Toxicities included the persistent B cell aplasia and profound tumor lysis and cytokine storm, seen 1–2 weeks into the treatment for ALL. This cytokine storm has been ameliorated by using anti-IL6 mAb. The B cell aplasia, while undesired, is acceptable, as patients can receive passive replacement of IgG, thus making their B cells “expendable”. These CART cells can traffic into the CNS. In ALL patients, it appears that each individual CART cell (or its progeny) can destroy 1000 tumor cells. Ongoing efforts in CarlJune’s program, and at other centers, are now moving into analyses of CART reactive with other tumor targets, by using mAbs that recognize antigens expressed on other tumors. Among these are EGFR on glioblastoma, PSMA on prostate cancer, mesothelin on ovarian cancer, HER2 on breast (and other) cancers, and several other targets. Because some of these targets are also expressed on normal tissues that are “not expendable”, novel approaches are being developed to decrease the potency or longevity of the CART effect, to decrease potential toxicity. This includes generating “short lived” CART cells by inducing CAR expression with short-lived RNA, rather than transfecting with a DNA construct that remains permanently. 40 severe adverse events (SAE) had been reported from 2010 to 2013. This supportive therapy have now been included in all protocols now and sites are engaged in developing pharmacovigilance protocol development for CAR-T therapy. What`s new in chronic myeloid leukemia research and treatment? The most widely used therapies are combinations of chemotherapy and radiation therapy.